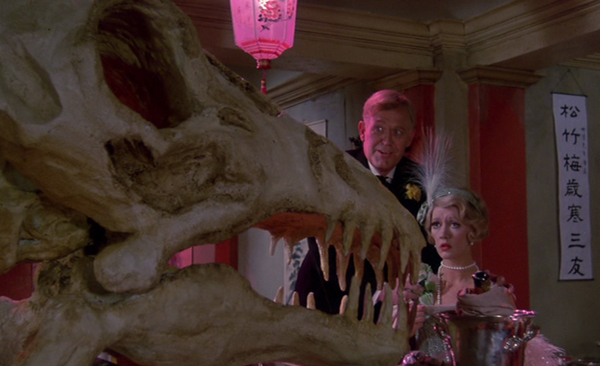 Oh look, there’s Colonel Mortimer, riding down the street on a dinosaur! (SPOILERS) There’s no getting round the dinosaur skeleton in the room here: yellow face. From the illustrious writer-director team who brought us Mary Poppins, no less. Disney’s cheerfully racist family movie belongs to a bygone era, but appreciating its merits doesn’t necessarily requires one to subscribe to the Bernard Manning school of ethnic sensitivity. I’m not going to defend the choice, but, if you can get past that, and that may well be a big if, particularly Bernard Bresslaw’s Fan Choy (if anything’s an unwelcome reminder of the Carry Ons lesser qualities, it’s Bresslaw and Joan Sims) there’s much to enjoy. 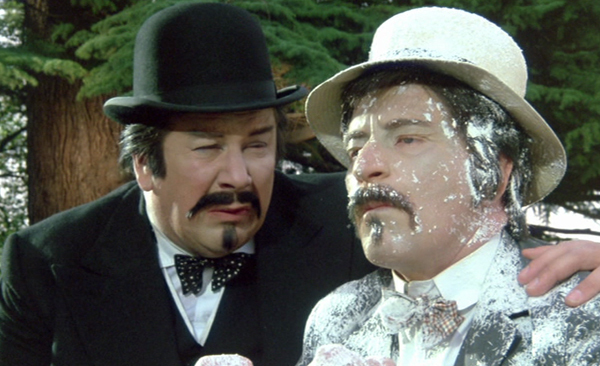 For starters, there’s two-time Best Supporting Actor Oscar winner Ustinov (as mastermind Hnup Wan), funny in whatever he does (and the only Poirot worth his salt), eternally berating his insubordinate subordinate Clive Revill (as Quon). This is a movie where, even though its crude cultural stereotyping is writ large, the dialogue frequently shows awareness of the underlying prejudices the casting has taken advantage of (“All English look alike” observes Quan. “Those eyes, you can never tell what they’re thinking.” “Most times they think of nothing, that’s our problem” comments Wan). As part of this, the stuffy British sensibility and presumed superiority comes in for a frequent bashing (“You think our Chinese water torture is bad? Ever had an Englishman explain a game of cricket to you?”) as does the notion of the British Empire being built on something as civilised as tea: the stolen formula for tea (“Chinese were making tea when English were swinging by their tails from the trees”). Which isn’t to suggest “That makes it okay, then”, but Dinosaurs isn’t entirely oblivious. Lord Southmere: Curious creatures, you know, nannies. You never know what they do on their day off. 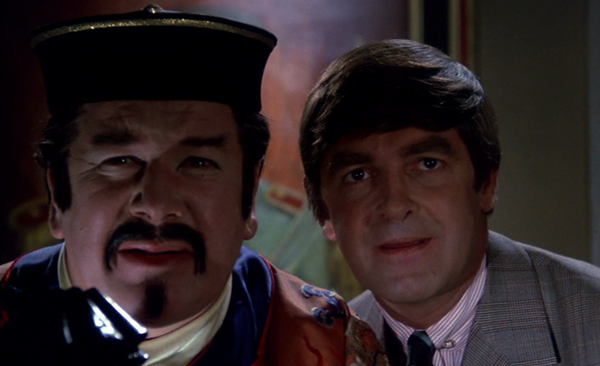 The joke is also that Wan, or Panda Nose (“Characteristic occidental nonsense”), rather backward in his toilet training, has been ruined by an English upbringing, putting him on a par with Derek Nimmo’s Loud Southmere (who sets off the plot by stealing the formula for the Lotus X, escaping through Tibet with the help of a Yeti – “Thanks for the lift, old boy. I don’t think you’re abominable at all”– and hiding the formula on a dinosaur skeleton in the British Museum). 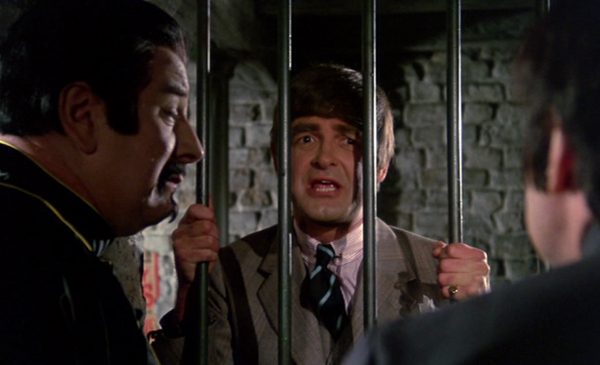 Southmere, once captured, spends the entire film being hit on the head between protesting that he isn’t a spy. And he isn’t. He isn’t furthering cause of the British Empire; he’s an agent of capitalism, as he has actually stolen the recipe for Won Ton Soup (perhaps symbolically, the last we see of Wan, he too has become a slave of market forces, selling cans of soup for Southmere Soup and Savoury). 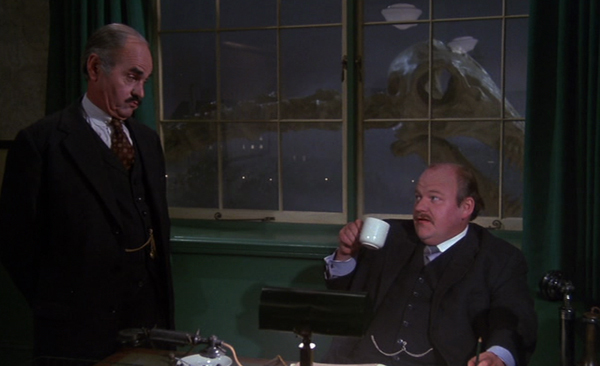 Superintendent Grubbs: Well, sir, taking it all in all, and as a result of the foregoing facts, I have reason to reach the following conclusions: A group of British nannies, numbering more than six, acting in concert with a group of aliens, numbering more than fifteen of oriental extraction, have conspired to pilfer the dinosaur. Home Secretary: Orientals and nannies? Why on earth would they do that? Superintendent Grubbs: Their motive, sir? That is precisely the subject of my next inquiry. As such, it’s left to the womenfolk, or the nannies, those responsible for raising the ineffectual men, to sort things out. 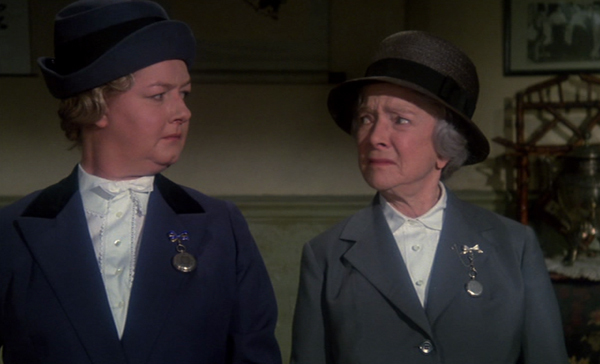 Helen Hayes is marvellously formidable and imperious as Hettie, and Joan Sims quickly rather irritating doing her distressed, highly strung act as Emily. Natasha Pyne’s enthusiastic novice Susan, meanwhile, is the unvaunted ace in the pack, stealing many of her scenes (“Oh this is so exciting. I feel absolutely biblical” of being in a British Museum whale, “chomping” a dinosaur’s mouth shut on a fellow nanny’s arm, punctuating incidents with “Isn’t this thrilling?” and, embarking on a train, “I wish I knew where we were going. Oh, I do hope it’s somewhere exciting”). 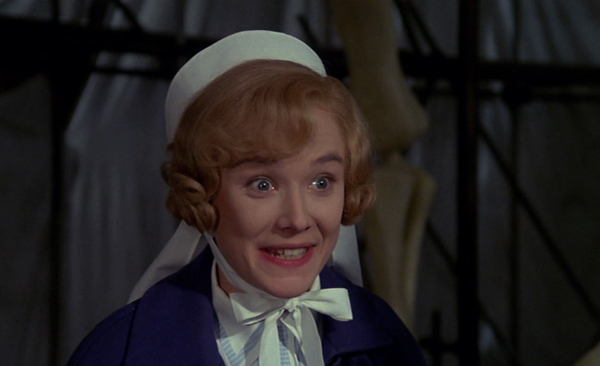 They should have cast her in Nanny rather than bloody Wendy Craig. Emily: Suppose the beast fell on top of us? Hettie: Then we would be the first people in two million years to be killed by a dinosaur. (Well, not according to official records, but maybe nannies know, you know.) 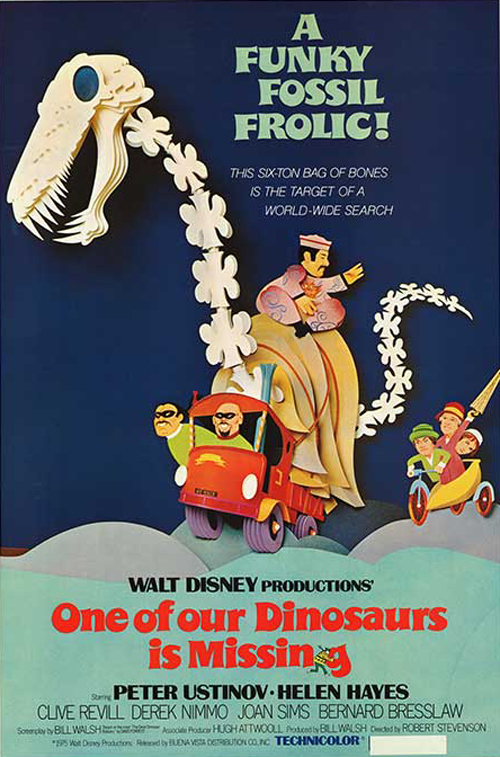 Like many a ramshackle live action (and animated, come to that) Disney of this period, tight plotting and direction aren’t Dinosaurs’ strong suit, but that’s often made up for by the string of cameos en route. There’s Roy Kinnear as a Scotland Yard inspector, Hazel MacWitch (Molly Weir) as a Scots Nanny, Max Wall as a juggler, Joss Ackland as a Texan (“You just know this country boy’s going to have that big ol’ dinosaur, don’t you?”), Joan Hickson (Helen Hayes also played Miss Marple in the ‘80s; all that was needed was David Suchet and Margaret Rutherford to complete the Christie list), Amanda Barrie, Frank Williams, Frederick Jaeger (as a German newsreader), Jane Lapotaire (memorable as Gene Hackman’s permanently sozzled wife in Eureka) and Richard “Mole” Pearson. Hamish: Why would she leave the crystal waters of Loch Ness for a dirty, muddy old London River? Jock: It’s a sad end indeed for the loyal Scottish monster. 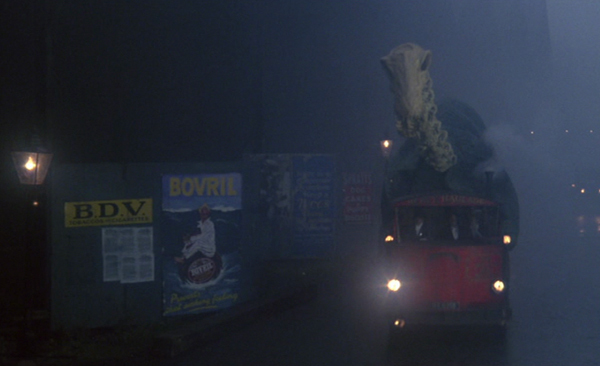 Some of the best of these come during the movie’s protracted central set piece, when “Ladies steal dinosaur!” and Wan and his men give chase through the fog-shrouded London streets. 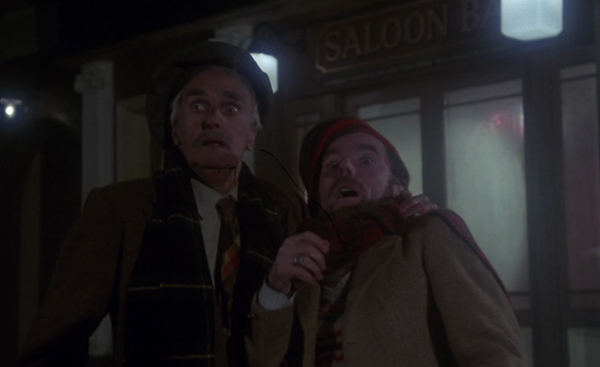 John Laurie (Jock) and Angus Lennie (Hamish) are on hand to remonstrate that it has come to this for their proud monster before returning to the pub. 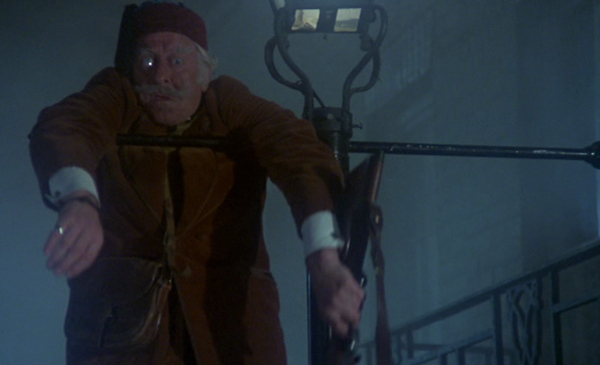 Soon after, Jon Pertwee shows up in one of his best cameos (with Black Narcissus’ mad Kathleen Byron as his wife, doing a spot of tarot), furthering the theme of an incompetent and past-it Empire, as an eccentric colonel elated by the chance to shoot himself a rare prize (“Wonderful luck, my dear. A creature I’ve never bagged before”). Lord Castleberry: At my age, Mozart had already completed six concertos. Hettie: I don’t care what those foreign boys get up to, go and join the game. 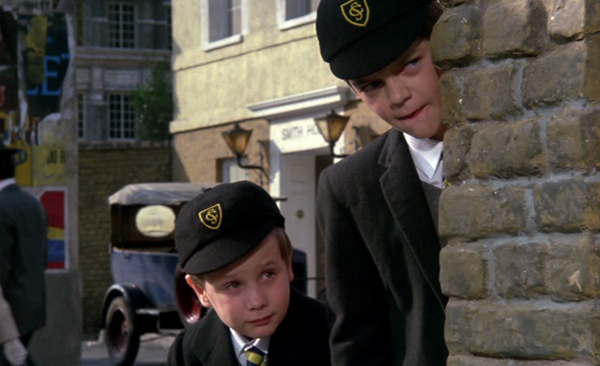 Even the kids (Andrew Dove and Max Harris) are pretty good performers and remarkably non-irritating (and, going with the theme, little mercenaries through and through, happy to tag along with “Uncle” Wan for payment: “Alright boys, go and play with the pterodactyls. I will go and look at the, um, diplodocus”). The other aspect of Dinosaurs (the title is a riff on Powell and Pressburger’s One of Our Aircraft is Missing) that bears mention is the superlative score from Ron Goodwin. Admittedly, there’s a swathe of stereotypical Chinese cues in the incidentals, but the main theme is up there with his Margaret Rutherford Miss Marple theme as one of his very best pieces (and it’s a crime that it isn’t available to buy). 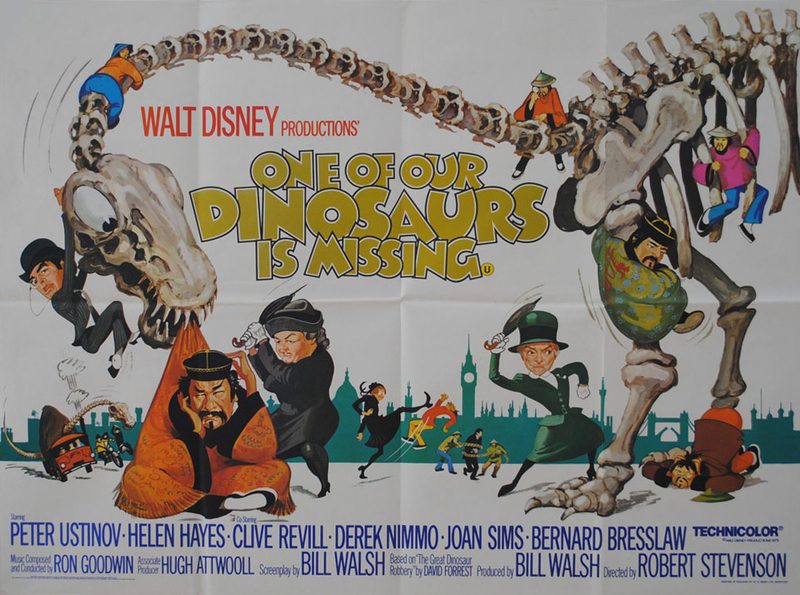 It’s probably for good reason that Disney isn’t exactly shouting about this one, or looking to remake it in a hurry (even if a way was found, that it doesn’t feature a “live” dinosaur would probably be met with storms of protest from the target audience). They’re probably wanting to leave it undisturbed, but for all its inappropriateness, it’s blessed with a fine comic cast and a likably absurd premise. One of Our Dinosaurs is Missing is undoubtedly something of a dinosaur, and much of its appeal is probably skewed by childhood nostalgia, but there’s something visually unbeatable about a dinosaur skeleton on the back of a truck, it’s neck careening about, at it’s pursued through the fogbound London streets, to an infectiously jaunty Ron Goodwin accompaniment.